I went fly fishing for the first time and absolutely loved it! I’ll be honest when I say that I didn’t think I was going to enjoy fly fishing as much as I did. I have been inshore salt water fishing many many many times with my dad in Florida, but fresh water fly fishing is completely different. For my first time fly fishing, I got to experience it with my mom, my dad, and my husband. 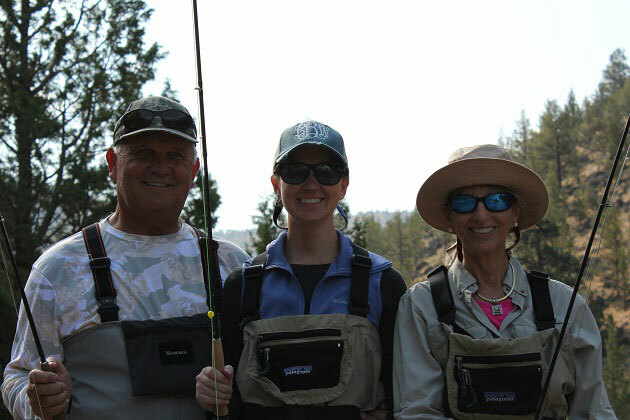 My mom and dad were visiting from Florida and wanted to fly fish while they were here. 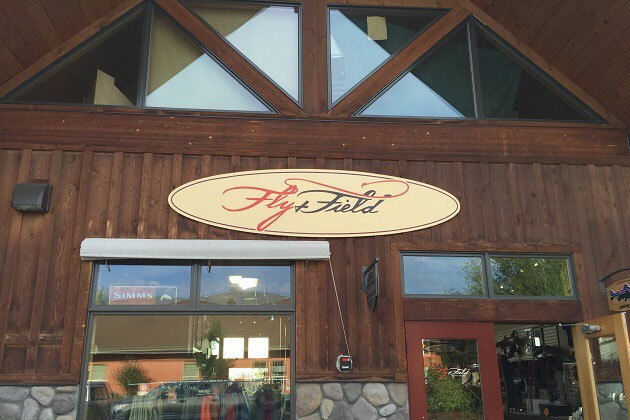 We booked a half-day guided trip with Fly and Field Outfitters here in Bend, Oregon and showed up bright and early at their fishing store in town to get geared up. They rented us waders and boots, and of course the fly fishing rods, reels, line, and flys. We also purchased a fishing license for the day, which was something I probably wouldn’t have thought of it I tried to go on my own. I highly recommend that you get a guide for your very first time. 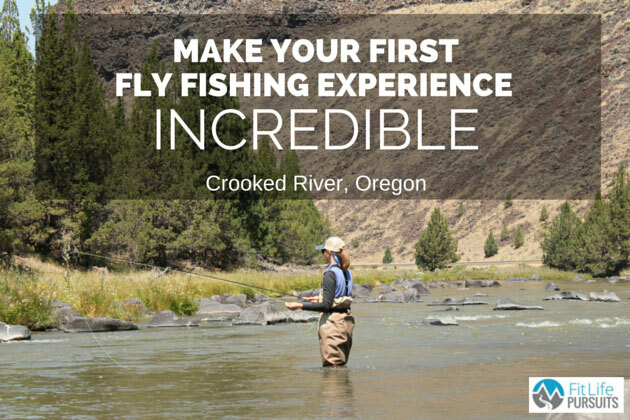 They can provide you with all the necessary gear, take you to the ideal fishing spots, teach you all about the fly fishing basics and fly fish casting, and help make your first-time experience a lot more fun! If you decide not to take a guide, at least take a class at your local fly fishing shop before you go. You really need a good base of knowledge before heading out on your own. Our guide, Martin, picked out the flys for us. Otherwise, I would have had no idea which to choose. If you are going to choose your own flys, you’ll need to do a lot more research about the area and the fish feeding patterns at the time. He also rigged up our rods and tied on our flys. I have done this several times with a spinner reel, but never with a fly rod. It looked a lot more intricate! 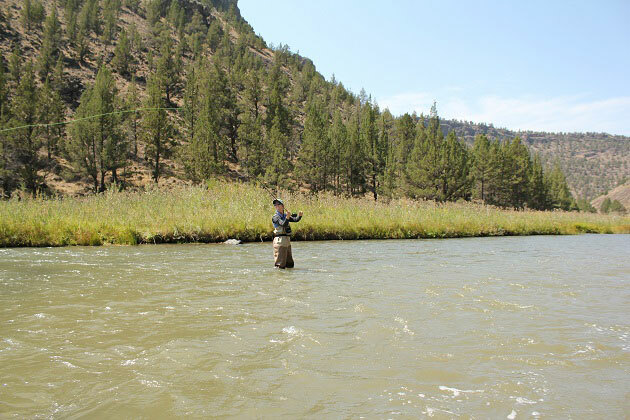 When fly fishing, you can either wade or sit in a float boat. We waded on this trip, and while I was a little nervous about standing in the cold water for hours, I believe it ended up being the better decision. There is just something about being in the water that made me feel more connected to my surroundings. It wasn’t scary at all either. No sharks or barracuda to worry about! My waders and boots worked awesome. They were from Patagonia and I didn’t get a drop of water on my socks and boots after standing in the water the entire day. I was impressed. Make sure you have a good pair of waders and boots for your trip. You will be much happier and a lot less soggy at the end of the day. 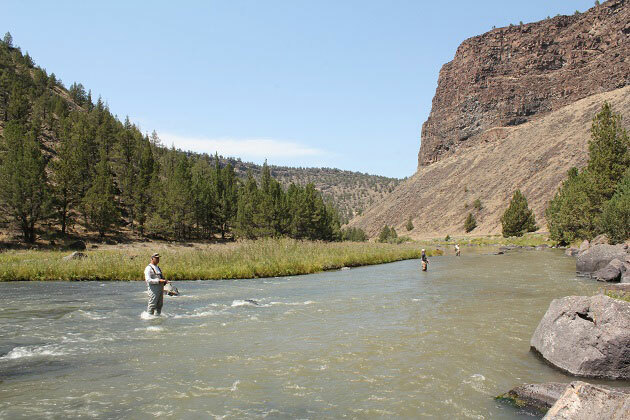 We drove about an hour outside of Bend, Oregon to Crooked River, near the Prineville Reservoir State Park. The scenery there was beautiful and I’m eager to go back there for some camping! Once Martin helped us pick out our wading spots in the river, he taught us each about fly fish casting one-by-one. 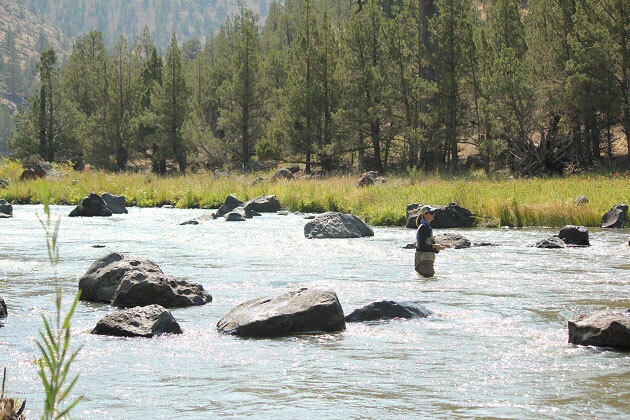 The key to fly fishing, after choosing the right flys and the right fishing spot, is being very precise with your casting placement in the river and the drift of the fly through the current. You want the fly to look natural as it floats right over a fish. Otherwise, they won’t go for it. If you find the perfect combination between these, then you’re more likely to actually catch a fish! We all started off a little slow, which was expected. About an hour into fishing, my dad was the only one that had caught anything. Then we all started having better luck and caught several trout of various sizes back to back. We stayed in the same spot for a while and then decided to make a move up the river to an area with a “magic carpet”, meaning that instead of wading over rocks and dirt, we were wading through a blanket of moss. This made it much easier to walk through the river. We caught some more fish in this area and moved on one more time. We were all spread out throughout the river, but within the same area. We were mostly fishing for trout, and we ended up each catching several rainbrow trout and mountain whitefish throughout the morning! Woohoo! Go us! The biggest fish we caught all day was about a 13-inch trout, not too bad, but definitely not comparable to some of the snook and redfish we’re used to getting in Florida. I can only imagine how fun it would be to land a big ole’ trout with a fly rod! All the fishing in this area was catch and release, which I am fine with. While I love eating fish, that was not the purpose of this trip! It was more exciting to learn the ins and outs of fly fishing. Plus, the cleanup is much easier! I learned that there are basically two kinds of fly fishing: dry fly fishing and everything else. We started off learning in the “everything else” category, which is a lot less technical when it comes to casting. Towards the end of the morning, Martin started teaching me some dry fly fishing techniques. I am proud to say that he called me “a natural”. Woohoo! Dry casting was a lot more challenging, but a lot of fun. It involved creating a smooth acceleration of the line to the back and then again in front of you. I was able to practice this technique for a bit before we ended up calling it a day. It was definitely a good day! We all caught fish and had an incredible time learning, fishing, and enjoying the view. If you have never waded through a river current, over rocks and slippery moss, then you have never truly had your balance tested. I definitely had to take my time and carefully watch my step so that I didn’t end up falling into the river and soaking myself. I’m really surprised that it didn’t happen on this trip because I was really struggling! 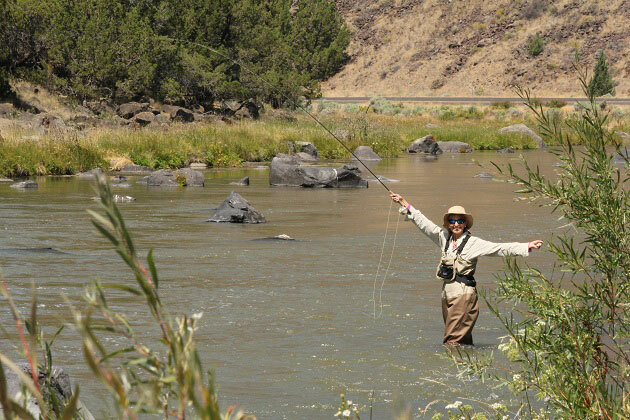 If anyone tells you that fly fishing is not a physical activity, they are flat-out wrong! Not only was the wading challenging, but my casting arm and wrist were pretty exhausted by the end of the day. Fly fishing was an unexpected challenge, and so worth it! Not only was fly fishing fun, but the scenery was beautiful and I got to spend the day being active outdoors with my family. It doesn’t get any better than that! 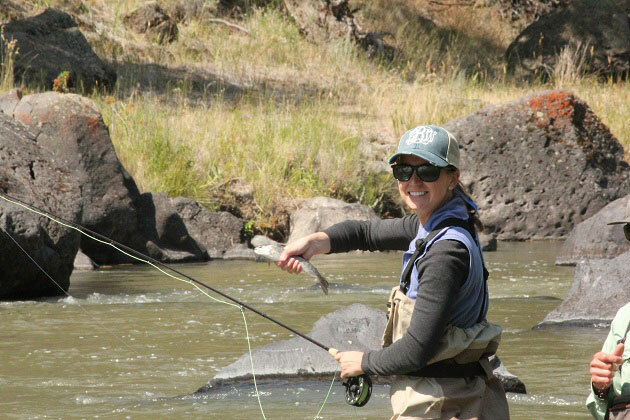 I would recommend fly fishing to anyone looking for an incredible outdoor experience. 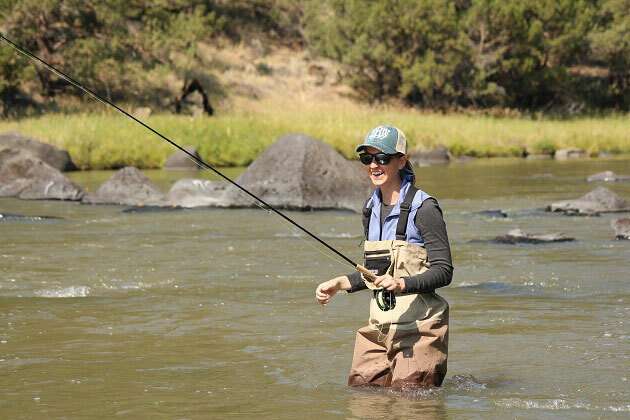 You can get some more tips for getting into fly fishing here. Have you ever been fly fishing? 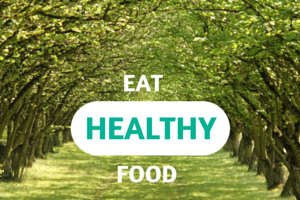 What’s one new thing you’ve tried lately? First of all, you have got great pictures. I love fishing and I am a beginner. For the first time, I will be doing my first fly fishing in a couple of weeks. I was researching on the web for fly fishing and came to this beautiful piece of article. As this is my first time, I will definitely take a guide as you did. I did not know that there were two types of fly fishing. But now I know and I will start off with “everything else” because I am a pure amateur. Thanks for sharing your first time experience. I’ve been wanting to look for a good fishing guide. 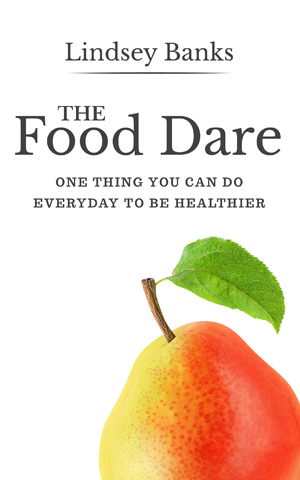 I’m going to have to look at some of the unexpected challenges of fly fishing like you talked about and how it is really a physical activity. I’m going to have to look for some quality fishing guides and see what we can find! This is really a great fishing guide. I’m new in fishing. Hope will try some of your tips soon. Hi Lindsey! What kind of waders are those? They look a little like the Simms kind that the guide has on but I can’t make out the logo. I would love to go fly fishing one day. My boyfriend and I will go fishing this summer because it is one of the things that are listed on our bucket list. We haven’t book for any trip or tour yet, but we plan to hire a fishing guide since this will be our first time. It really helped when you said that, to do the fly fishing properly, you must be precise with the placement of the cast on the river. Thanks for the tips! 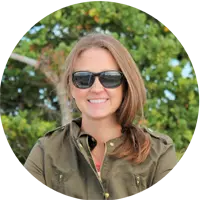 Hi Lindsey, I am so thankful for what you have shared that first flying fishing experience could be very, very memorable. I found it interesting when you mentioned the “everything else” type of fishing. Oh please, I’d be interested to learn more about it next time. I’ll bookmark this link, cheers!